Krecipes is a program that lets you to manage your recipes, create shopping lists, choose a recipe based on available ingredients and plan your menu/diet in advance. Based on SQL, supporting various database types (currently it supports SQLite, MySQL and PostgreSQL). Should be as flexible as possible to have the possibility to extend it in future. Recipes can be searched by name or by ingredients included or to be omitted. Simply type in a part of a recipe name and all those recipes are instantly available to view, edit, or print. If you'd like to fine-tune your search, the advanced search also allows you to search by title as well as any combination of categories, ingredients, preparation time, authors, servings, or instruction text. 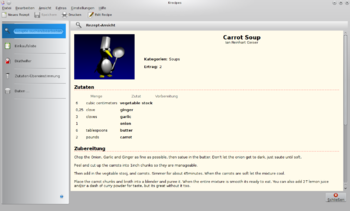 Using the three input tabs, you will fill in the details of your recipes. On the first tab is the title, authors, categories, preparation time, and yield. On the next you may input ingredients, and on the last is the instructions. Recipes can be printed for inclusion in scrapbooks, etc. Backup and Restore of database is fully supported. Add recipes to your shopping list. 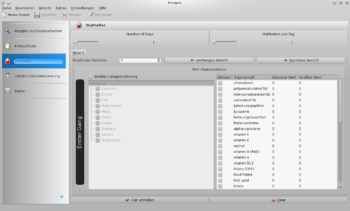 When you are done, Krecipes will list all the ingredients necessary, combining units for you automatically, and give you a list ready to print. You can search for recipes based on what you have in your store cupboard. Plan out your meals for a day, a few days, or even weeks. Give Krecipes information on what you'd like each of your meals to contain, limit the amount of particular nutrient property (fat, energy, etc. ), and Krecipes will do the rest. 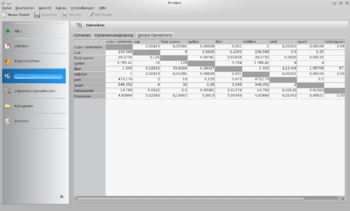 Krecipes takes full advantage of the power of relational databases. Categories, ingredients, units, etc. are stored as separate identities which are linked to recipes when used. You can rename one of these in one place, and all recipes using that element are automatically updated. When importing recipes from an external source, you may find many misspellings and strange capitalization. Simply rename these elements in the "Data" panel to correct all your recipes. For example, you may have the categories "Vegtables" and "Vegatables". Rename "Vegtables" to "Vegatables" and the merge feature will put all the recipes under these two categories into the right category. 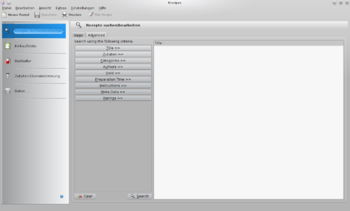 You can use the KDE Bug Tracking System to report bugs. User interface: We could always use help translating into as many languages as possible. Note that the current 2.0 branch is not on string freeze, however some translation teams are working in Krecipes anyway, so feel free to join your local translation team and work. Handbook: Currently the handbook in english is very outdated, please wait for instructions. Sample recipes: We are figuring out a technical solution and proper workflow to do this, please wait for instructions. Give us your feedback in the Forums or in #krecipes IRC channel at FreeNode. 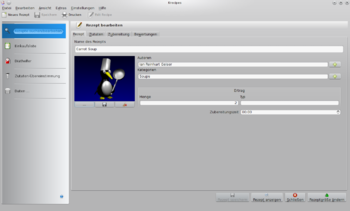 The handbook is being updated for the KDE 4 port of Krecipes and unfortunately it's not finished yet, you can check it here. You can download the latest release or see other releases in the "files" section of the sourceforge page. You can see main changes in this version in the ChangeLog page. 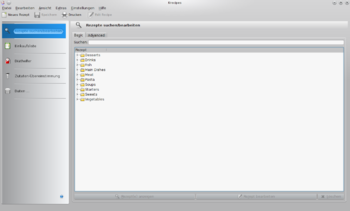 The project is being developed under extragear/utils in KDE's servers. This page was last modified on 21 December 2014, at 11:02. Content is available under Creative Commons License SA 4.0 unless otherwise noted.